Apple’s year-old iPhone, the iPhone 4S was the second best selling phone in the world during the fourth quarter, according to new data from research firm Strategy Analytics.The iPhone 5 was the best selling phone in the world for the quarter. 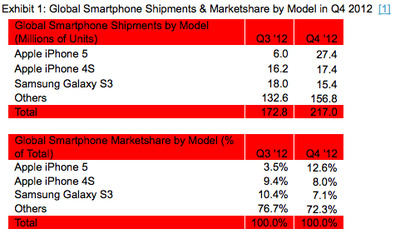 The Samsung S3 was the third best selling phone. This is an important data point for anyone paying close attention to the tech news lately. Samsung is out-innovating Apple, according to some in the tech press. Others in the tech press claim that Apple’s is blowing it by not offering a smartphone with a bigger screen. The fact that Apple’s iPhone 4S and iPhone 5 are outselling Samsung’s top of the line smartphone suggests that consumers don’t think Apple is getting out-innovated. 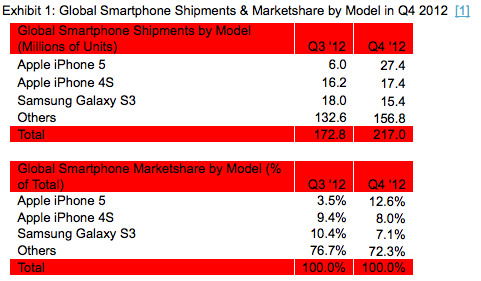 Consumers also don’t seem to care about the size of the screen. What people want are iPhones. What stops Apple from competing with Samsung isn’t screen size or features, it’s price and distribution. That’s why just about every single sell-side analyst is pounding the table for Apple to release an inexpensive iPhone to compete in developing markets.